The OleumTech® Sigfox Ready SFX-LS52 Wireless High Level Switch Transmitter is designed for deployment anywhere in the world that Sigfox has network coverage. By leveraging the Sigfox Low Power Wide Area (LPWA) network, you can take advantage of the world’s leading Internet of Things (IoT) connectivity service, offering a software-based communications solution where all the network and computing complexity is managed in the Sigfox CLOUD™. The SFX-LS52 wireless sensor node is certified for use in Class I, Division 1 (Zone 0) hazardous locations. It is intrinsically safe, designed not to cause a spark, and can be serviced without being removed from a process. This wireless IoT device is designed to be mounted on the side of a tank for detecting high level conditions. 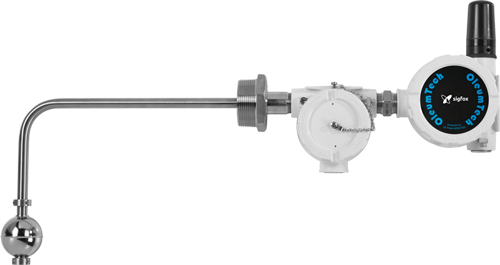 A high level switch of 316 stainless steel material is included.